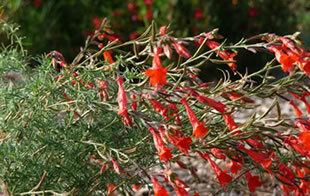 Many of you may be familiar with one of California’s best, and most widely distributed plants, Epilobium canum, although you may know it by other names, common and botanical - California Fuchsia, Hummingbird Fuchsia, Hummingbird Trumpet, or Zauschneria. Epilobium canum began its recorded life as Zauschneria californica, and stayed that way for several centuries, until botanists decided to give it an identity makeover and moved it to the Epilobium family. And, although it is referred to commonly as the “California fuchsia” of course, it isn't a true fuchsia either, having earned that nickname from the flowers’ look alike color and shape: tubular with protruding stamens. A lovely plant with a profusion of cheery red or orange flowers in late summer and fall, the Epilobium canum has a fair number of wild admirers, including the hummingbirds for which it is named. The hummers have plenty of company, since bees and butterflies also collect its nectar. Epilobium canum is widely distributed and grows to elevations of up to 10,000' in dry areas, rocky slopes and cliffs, and montane coniferous forest from San Diego Co. to Oregon. As might be expected, it’s undemanding about soil types, and has very low water requirements. It grows fast, in full sun or part sun and is useful for erosion control. It will spread by roots, so some elbow room or containment is a good idea. For it to look its best, it should be cut to the ground annually after blooming. Epilobium canum ssp. canum, a.k.a. Hoary Fuchsia, is a closely related ‘cousin’ whose flowers are almost identical, but whose leaves are more grayish in color and more linear. Both make fine additions to any garden, and will brighten the lives of any hummers in the area.